At 0024 hours, Box 48-2 dispatched Company 48 (Hershey) and Truck 46 (Hummelstown) to the area of 30 N. Hockersville Road for a structure fire. Additional info put the location on Old West Chocolate Ave in the area of the Mill Restaurant. Chief 48 (Leonard) went on scene with a well involved, 50 x 70, commercial building in the 800 block of Old West Chocolate Avenue and requested the working fire assignment. All companies went into a defensive posture once arriving on location. The metal type building was used a wood door manufacturer with several explosions occurring early into the incident. Engine 48 (Hershey) arrived and led off using their deck gun while additional companies began stretching lines and setting up aerial devices. Heavy fire consumed the building and was being fed by a broken gas line near side A of the structure. Multiple hand lines and ladder pipe operations from Truck 46, 48, and 1 (Palmyra) poured water on the building for several hours before the fire was placed under control. Several collapses occurred during the operation. 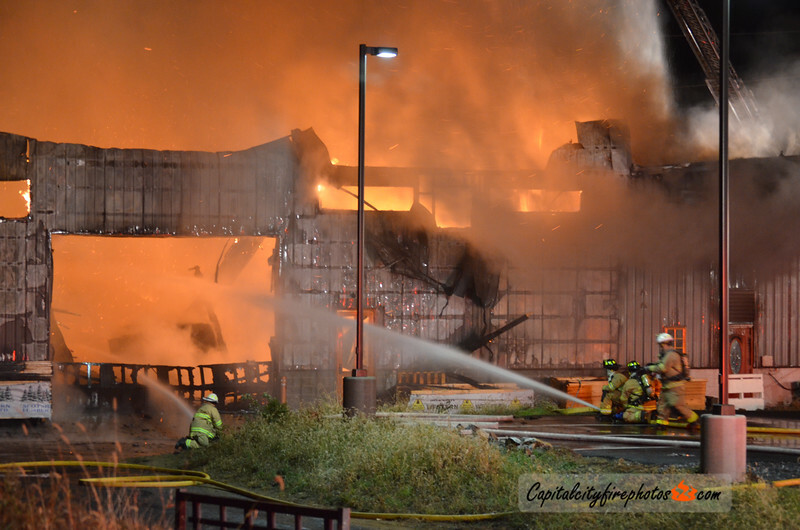 A layer of foam was applied on the smoldering ruins before companies cleared the scene around 0700 hours.